Just a quick reminder for Boston Marathon fans - the registration process will open next Monday, September 9, 2013 at 7:00 a.m. PST. This is the first day of the "rolling registration" that allows faster qualifiers to register first, as used for the 2012 and 2013 editions. So if you beat your Boston Qualifying time (BQ) by 20 minutes or more, you're up!!!! Not that it's going to be easy to get in, mind you. The standards are tougher (see table below), and I have met many-a-runner inspired to renew their BQ goals to be a part of the "healing year" for this great American race. If my very small sample size is any indication, I suspect there will be 20-30% more runners ready to apply. So if it's important to you, be sure to register as soon as you can. 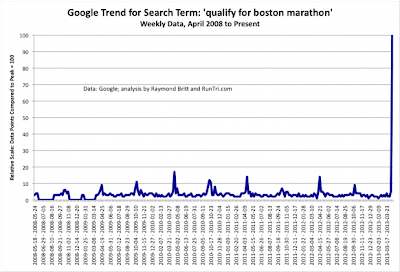 I'm looking forward to the 2014 Boston Marathon with great anticipation. My original goal was to streak ten Boston's (I still can't recall where this goal came from....beer was certainly involved), and this will be #10. But more importantly, I hope my participation will further honor the community of Boston and celebrate their extraordinary strength and resolve. I know they've got my back, so I'm coming back! 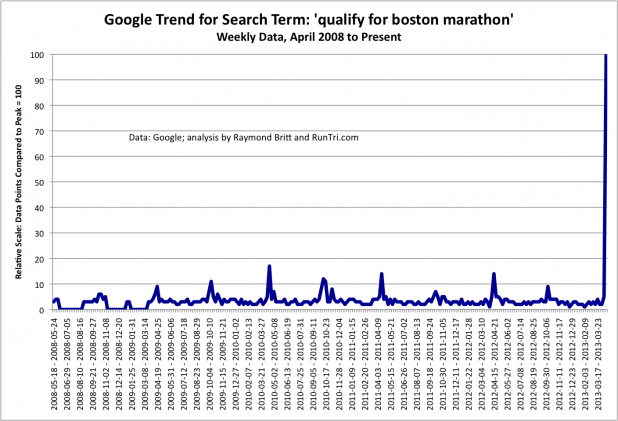 More detailed information about qualifying/registering for Boston can be found at www.baa.org. An additional 59 seconds will NOT be accepted for each age group time standard. That is, there is no cushion or flexibility with the minimum qualifying time for purposes of qualification eligibility. Dude - how are the bruised ribs holding up? Are you still going to make it to Ironman Lake Tahoe? I just finished my first week of rest since falling off the Matterhorn (ha, ha), and I'm still not quite able to run, and DEFINITELY not able to swim. If you've ever had bruised/cracked ribs, you know what it's like - as soon as you feel fine, you keel over while getting dressed because it tugged at the sore muscles in just the wrong way. Congrats on your Boston streak! (Your video from last year of the Scream Tunnel was amazing!) I'm not one for big events and I have zero chances at qualifying, but can't wait to hear about 2014. That's going to be a very emotional day. Thanks for the correction, MJ! thanks for sharing a good blog..